Tim Hortons has a hot new coupon! 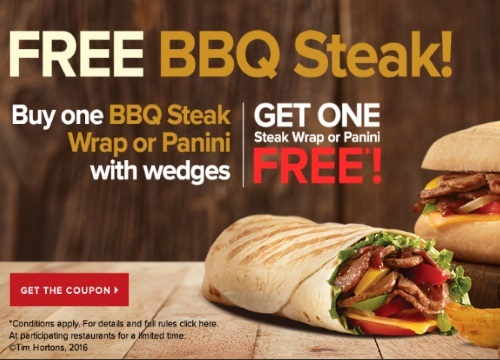 Get a coupon for a Free BBQ steak (or Panini) when you buy a BBQ Steak Wrap or Panini with wedges! Coupon redeemable for one BBQ Steak Panini, BBQ Steak Wrap, Philly Steak, Steak & Cheese Panini, or Chipotle Steak Wrap. Valid only at participating restaurants in Canada during applicable hours. Additional charges apply for bacon and extra cheese. Taxes extra. Cannot be combined with any other offer, discount, coupon or combo promotion. Limit one coupon per guest per transaction. No cash value. No substitutions. Void where prohibited by law. Coupon expires at 11:59pm on July 31, 2016. Also, click here for the Tm Hortons Free Salad coupon that we blogged earlier.